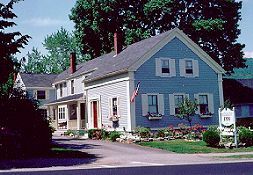 A classic village inn on the Maine Coast, the Blue Harbor House Bed and Breakfast welcomes guests to relax in a restored 1810 Cape where yesterday's charms blend perfectly with today's comforts. The beautiful village of Camden, renowned for its spectacular setting where the mountains meet the sea, is just outside the door. 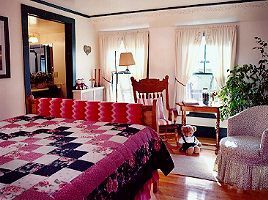 The inn's inviting guestrooms are bright with country antiques and hand-fashioned quilts; several have canopy beds. Breakfasts feature such specialties as fat free stuffed French toast, chocolate breakfast tacos, and blueberry pancakes with blueberry butter. Dinner, available to guests by reservation, can be a romantic candle-lit affair or an old-fashioned Down East lobster feed. Guestrooms and Suite have private baths. 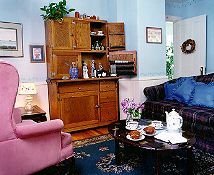 All are air conditioned, have TV/VCR and telephone. Some rooms have whirlpool bath or antique soak tub, gas fireplace. Room rates are $125-$205, including breakfast. Dinner service-$40 per person. A deposit is required to confirm reservation. All major credit cards accepted. Smoking is not permitted in the Inn. 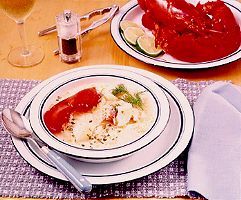 Lobster Lover's Special - This season at the Blue Harbor House, you can feast on the freshest, sweetest lobsters around! Just come spend two nights with us, and we'll treat you to a Maine lobster dinner for two served right here at the Inn. The cost of this special package is just $400 per couple for two nights in one of our queen rooms, $450 in a Carriage House Suite and includes a 2 hour sail on Penobscot Bay. Two of Dennis' outrageous breakfasts are also included. This and other Camden Bed and Breakfast Inns can be found here in The Register.